Dusts of Jupiter is a simulation reproducing the experience in a nightly dream. On 16th February 2015 I dreamt that I was near the planet Jupiter. I was putting my hand into its clouds, knowing that it is a gas giant and consisted only from gas particles. I was questioning, whether these particles are gas or dust. I woke up with this question in my mind. On preceding days to this dream, I was reading prior to sleep about solar system planets, especially about the gas giants Jupiter and Saturn.  Jupiter’s gas clouds contain chromophores, which are orange and brown clouds and they change color when they are exposed to ultraviolet light from the Sun. They are believed to be made of phosphorus, sulfur or possibly hydrocarbons. Exactly this was my intention when I was reproducing my dream related to the clouds around the Jupiter. Only that it was not “really” possible for me to touch these clouds. Instead in my imagination I builded a model of this possibility. The interactive installation “Dusts of Jupiter” demonstrates based on subjective dream experience how it could be to touch the gas surface of Jupiter, if it would be possible to do so. 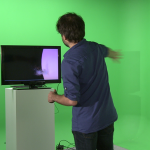 The interaction with the simulated gas particles is enabled to the observer through the virtual reality simulation. 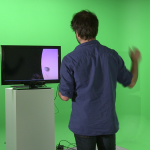 His movements are captured by the kinect sensor and immediately repeated in the simulation. The observer can move the representation of his right hand into the gas cloud and manipulate the particles virtually. 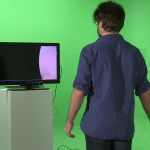 Jean Decety and Marc Jeannerod showed in their 1995 virtual reality experiment “Mentally Simulated Movements in Virtual Reality”,that “the process in humans which produces motor imagery is the same process that is used in actual motor control. Their results supported at the same time that the motor imagery involves not only a perceptual memory system, but also that it has temporal characteristics that appear to be specific to motor output. The “Dusts of Jupiter” dream shows that it is well possible to make visual and motor thinking experiments in dreams. On the other hand the reproduced simulation of this dream suggests that the dream experience can be shared, This experience sharing happens through the motor imagery which is translated back into reality when the motor output is reproduced by the active observer of the simulation. – Strycker, P. D.; Chanover, N.; Sussman, M.; Simon-Miller, A. (2006). A Spectroscopic Search for Jupiter‘s Chromophores. DPS meeting #38, #11.15(American Astronomical Society). – Blagrove, Mark. „Dreams as the Reflection of Our Waking Concerns and Abilities: A Critique of the Problem-solving Paradigm in Dream Research.“ Dreaming 2.4 (1992): 205-20. Print. – Decety, Jean, and Marc Jeannerod. „Mentally Simulated Movements in Virtual Reality: Does Fitt‘s Law Hold in Motor Imagery?“ Behavioural Brain Research 72.1-2 (1995): 127-34. Print. – Revonsuo, Antti. „The Reinterpretation of Dreams: An Evolutionary Hypothesis of the Function of Dreaming.“ Behavioral and Brain Sciences 23.6 (2000): 877-901. Print.